It is frequently said that the most important stop on any instrument is the ambience. This is because the acoustics of a large reverberant space adds softness and scale to the sound. This is also an essential ingredient to achieve that majestic grandeur that is a signature of the sound of the pipe organ. 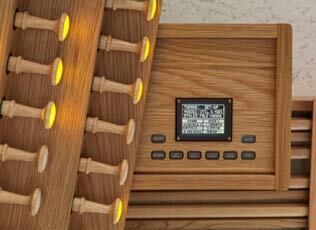 The Ouverture organ has been specially designed to recreate the magnificence of the acoustics of a large reverberant space in a compact console, so that the organist can replicate the same exhilarating sound experience of a real pipe organ, directly in the living room or study. 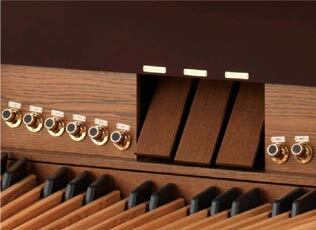 The Ouverture uses a revolutionary new sound system developed by Viscount called RAR (Real Audio Rendering). It is able to simulate multiple sound reflections of the walls, projecting the organist at center stage and involving them in an unforgettable sound experience – even from their living room or studio. The majestic console was inspired by the artisanal organ crafting of French builder Cavaille-Coll – one of the most noted pipe organ builders of the 19th century and whose legendary style exemplifies elegance and refinement. 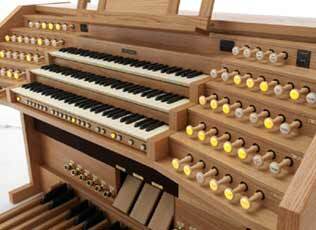 The instrument is equipped with four useful couplers in the sub-octave and super-octave, thanks to which the organist has an abundant variety of timbre combinations, within which the grand Plenum on the 32’ bass and the Concerto di Viole in 16’, 8’ and 4’ on the third manual. A specific tremulant for the reed stop “Vox Humana” has also been included for expressive and fascinating effects.A dedicated thumb piston for each section allows the organist to play Orchestral sounds chosen from an extensive library. 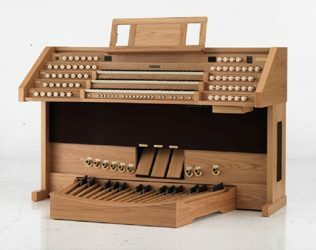 The Ouverture is a beautiful, as well as comfortable organ: the position of all the controls have been carefully studied and the music rack is both height and depth adjustable. 3 x 61 notes "tracker touch" keyboards, with velocity control for MIDI and Orchestra sections. 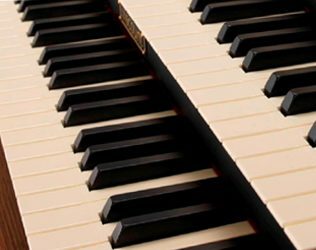 The OUVERTURE sets a new milestone in the reproduction of the classic organ sound as it effectively combines the unique RAR (Real Audio Rendering) and Physis® technologies, both developed by the Viscount Research & Development department. Physis® is a technology based on the creation of complex mathematical algorithms capable of simulating the physical and acoustical phenomena underlying the generation of sound in the pipe organ. It’s a completely different approach from common digital sound sampling because every single note, every chord, every slightest nuance of the performance is not the result of a simple “playback” of a sound but it stems from a sound generation process which operates fluidly in real time, just as it occurs organically and naturally in a physical instrument. 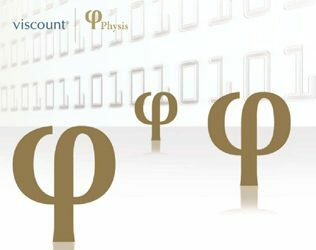 The modeling algorithms that make Physis® organs so unique is the result of a monumental amount of work that now allows the creation of innovative and versatile instruments, redefining the state of the art. The detailed parameterization given by Physical Modelling, combined with the careful and lengthy work of components integration, has made the sound from the different speakers extremely natural. The result is a warm and enveloping sound, as well as detailed and transparent. You are clearly able to hear the individual stops even after the instrument has been built up to full organ. In this latter challenge, the innovative front speakers play a primary role. The high sound quality and the precisely calculated position allow them to add significant detail to the sound of the organ, highlighting the dynamic evolution of each individual rank’s timbre. 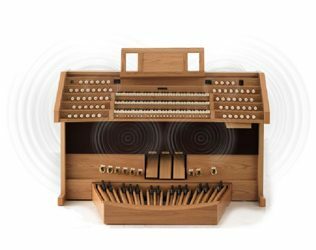 The new Viscount RAR (Real Audio Rendering) technology represents a significant step forward in terms of definition, spatiality and body of the sound, which is the most authentic way yet to create that magical effect of the most important organ stop – ‘the ambience’. Sitting at the console of the new Ouverture, you will experience the most realistic impression of the instrument and its setting available from any digital organ you may care to play. We have devoted special attention to the amplification system, in order to faithfully reproduce the impressive dynamics, the wide sound spectrum, and all the amazing spaciousness of the pipe organ sound. 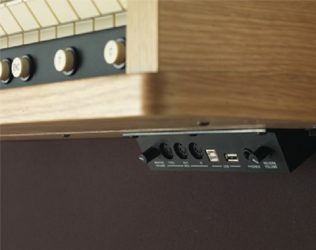 In addition to the traditional amplification, we placed two pairs of full-range speakers at strategic points on the console: one pair on the outside panels and one pair on the top stop jamb panel. In this way, as the sound comes from different positions, it is possible to simulate the multiple reflections of the walls, ceiling and floor of a large reverberant space. The effect is quite startling. You will experience a difference just as significant as that achieved when you add a surround sound system to your home television. A complete selection of external connections is smartly situated. In addition to Standard connections (MIDI In, Out, Thru; Headphones, stereo inputs), there’s a microphone with gain control, 4 external multiple outs + Sub – with the option to expand these to 12+1(Sub). There are also USB host and Device connections. For the USB Host connection, it’s possible to use a thumb drive to save and upload sound settings. The registers are activated through elegant wood stops which have been placed laterally for the most precise and egonomic result: every level corresponds to a solo division of the organ for which the selection of the registers is simple and intuitive. A rich selection of Orchestra voices are easily and quickly activated through dedicated pistons. Within the various controls, you’ll find tremolo specific for the register and “Voix Humaine”, which allows you to set very specific effects. OUVERTURE has been will thought out so every organist will have an accurate study of the position of controls, with everything comfortable and easy to see both above and below. The graphic display is well situated in a sliding drawer which maintains the classic aesthetic of the instrument. The three expression pedals provide a fluid and precise movement – allowing complete control of the volume for Manual I, the volume for Manual III – as well as the Crescendo.